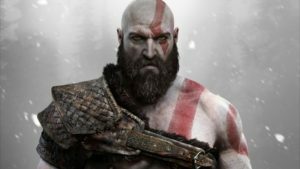 The yearly Call of Duty release always churns a frenzy of praise and criticism, sales figures and player numbers, and graphics and gameplay comparisons. 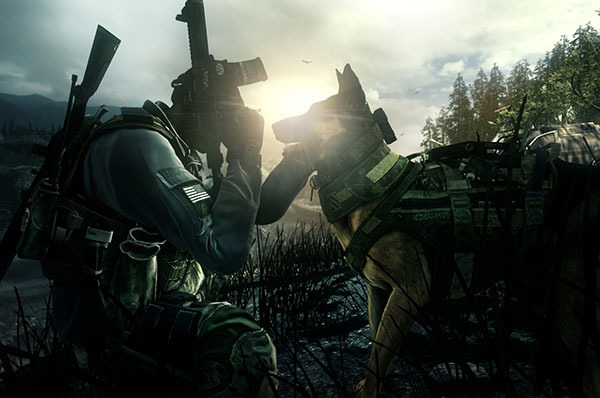 2014’s release of Ghosts has been no less contentious, and has possibly been the most fractious of the current-gen Call of Duty era since Modern Warfare (Call of Duty 4) turned the franchise on its multiplayer head back in 2007. While post-Modern Warfare Call of Duty games have generally received good scores on the review front, and fans have remained loyal, there is of course a vocal contingent of gamers who cry foul every year. 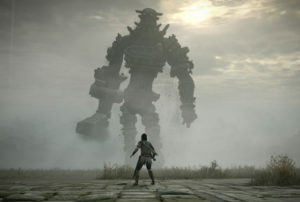 The games are often slated for barely innovating; using an outdated 3D engine; having lacklustre visuals; increasingly relying on set-pieces and gimmicks to carry the single-player campaign; having the same shallow run n’ gun multiplayer with a yearly coat of new game paint; and of course the pricey DLC map packs that offer “fan-favourite” maps spruced up for the latest iteration of the game. That’s before we even get into the nitty-gritty of no dedicated servers, peer-to-peer matchmaking issues, and hackers galore. Despite those who would point out its flaws, there are plenty who are happy with the yearly iteration of CoD – at least if sales figures and player numbers are anything to go by. Activision isn’t phased – always quick to proudly proclaim their latest CoD a financial success, and early indications are that Ghosts will be no different. But was Modern Warfare the high-water mark, and is Ghosts now feeling the undertow of the shifting tide? To get an idea of the critical progress of the Call of Duty series we can turn to arbiter of all scores aggregate, Metacritic. The charts below represent scores retrieved on 12 November 2013 for both official Metascore reviews and user reviews. It is worth noting that, for Ghosts, there are only 4 PC reviews listed, while most large publications have their console reviews in. 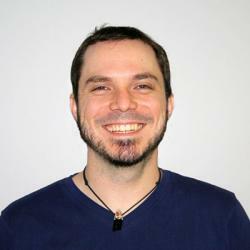 Scores for previous CoD titles will have stabilised by now. Plotting these scores to charts provides an interesting view of the Call of Duty franchise on the three major platforms (PC, Xbox 360, PS3). Call of Duty 4: Modern Warfare does seem to represent a peak for the franchise on all platforms. 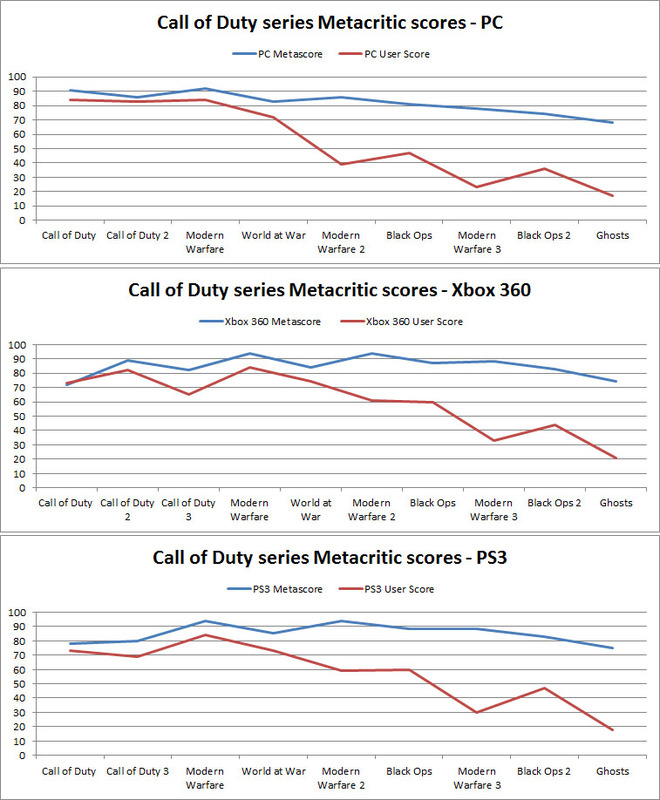 Post-Modern Warfare, review scores reflect a gradual decline while, in contrast, user scores show a drastic negative reaction from the gamers. 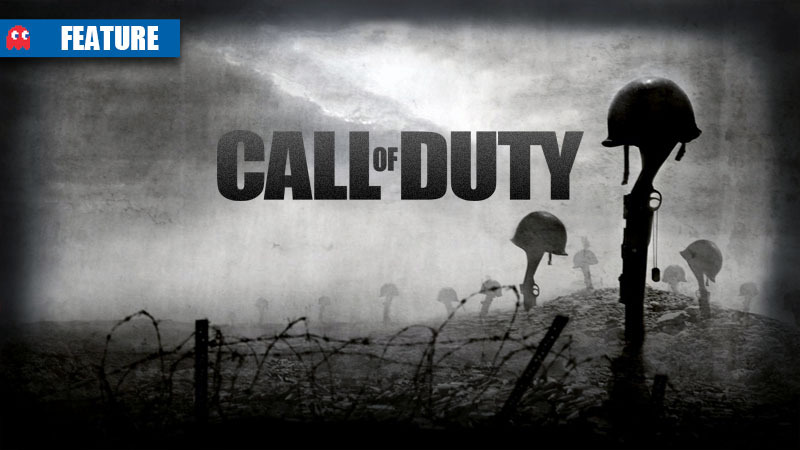 The PC platform show the most evidence of unhappy gamers from the Modern Warfare 2 mark – no doubt fuelled by the “no dedicated servers” controversy, and the general PC gamer disposition that they were being neglected in favour of consoles. For a title that promised to be ushering the Call of Duty franchise into the next generation of gaming, Ghosts represents a low-point for the series. The way review scores go these days, for a mega AAA flagship action game with the financial might of Activision behind it to hit the mid-70’s, should set alarm bells ringing. The user scores are obviously a grim representation of the general Call of Duty milieu. Will this be enough to spur Activision to reinvent Call of Duty, or will the franchise go the way of Guitar Hero? Activision has already confirmed there will be a Call of Duty game in 2014 – and for the hope of a grim spectacle akin to a tired Hollywood action hero being dragged out one more time to recite their famous one liners, I can’t wait to see it in action.